Harry Morey and L. Rogers Lytton are actively engaged in enacting the principals in the Vitagraph Broadway Star Feature, “The Woman in the Box,” now being produced under the direction of Harry Davenport. 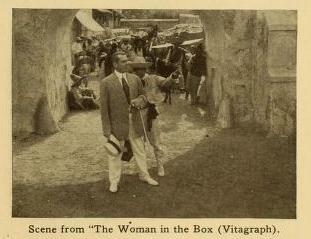 THE WOMAN IN THE BOX (Vitagraph), Oct. 23.—High-pressure romance, with scenes in Mexico and a U. S. Secret Service officer in love with the wife of a Mexican official, who is plotting against the United States, is found in this two-reel drama, written by Edward Wm. Fowler. The story is engrossing, the local color realistic, and the photoplay is vividly acted by Harry Morey, Peggy Blake, L. Rogers Lytton and George Cooper. A story of Mexico, during the days when intrigue and war alarms were threatening the precipitation of the present struggle in our sister country, is vividly told in the Vitagraph Feature production, “The Woman in the Box,” now nearing completion under the direction of Harry Davenport. Typical Mexican street scenes showing the Peon in his home life and pursuits, scenes that picture high officials of the War Department and the men of authority, who represent the wealth of Mexico, are graphically pictured, introducing the inner workings of the secret service and showing the palace of society members, whose vast estates are the beauty spots of the land. The action of the story revolves around Milton Asheton, of the United States Secret Service, and Señora Vallantino, the American wife of the Secretary of War for Mexico. “The Woman in the Box” is thoroughly Mexican and is of unusual interest because of its visualization of scenes in a country that has been prominent in the newspapers for the past four years. The players enacting the principal roles include Harry Morey, L. Rogers Lytton, George Cooper and Peggy Blake. Dos cintas con idéntico título se produjeron en los años 1910 y 1911. 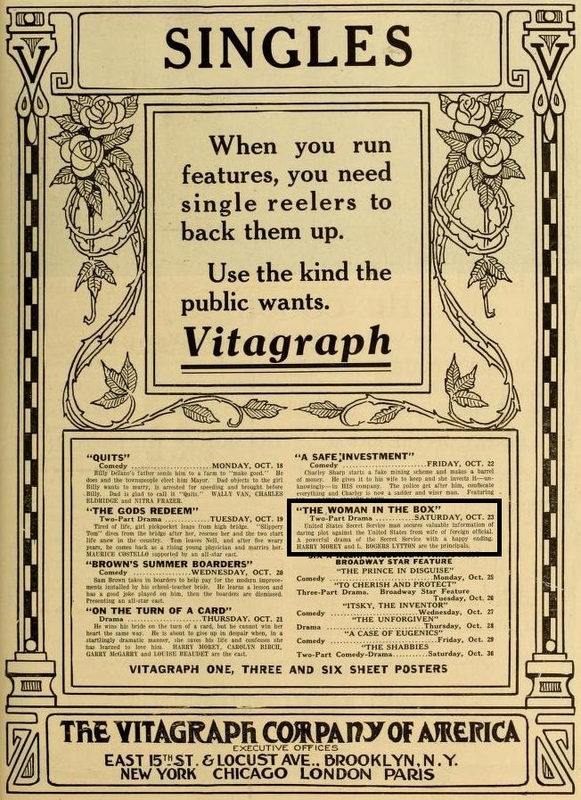 Una producida por la Vitagraph y otra por la casa Pathé. Una de ellas, la producción Pathé, se escenifica en México; la de la Vitagraph se desarrolla en un país utópico de Sudamérica, pero con personajes muy mexicanos como se puede ver en el fotograma adjunto. Ambas consideran al norteamericano superior al mexicano. En la producción de la Vitagraph filmada en 1910, unos norteamericanos salvan de un linchamiento a un individuo en un país imaginario de Sudamérica; en la filmada por la casa Pathé en 1911, un norteamericano salva a su novia llevándola al otro lado de la frontera. The Moving Picture World publicó sinopsis y anuncios de ambas cintas. De entrada la de la casa Vitagraph que se estrenó el 1 de julio de 1910. En The Moving Picture World del 2 de julio de 1910 (Vol. VII, No. 1, p. 34) se comenta su estreno junto con una comedia. On Friday, July 1, “Saved by the Flag,” a South American drama with a thrilling plot and picturesque setting. On the same film “Wilson’s Wife’s Countenance” will make this day’s release a double-header, two in one, with a total length of 997 feet. “Wilson’s Wife’s Countenance” is a bright little comedy, with a big laugh and sharp satire. Tambien en The Moving Picture World, pero en el ejemplar del 6 de julio de 1910 (Vol. VII, No. 3, p. 142) se publica una breve sinopsis de la cinta. Esta cinta, según el IMDb fue dirigida por Lawrence Trimble con las actuaciones de Ralph Ince y Edith Storey. 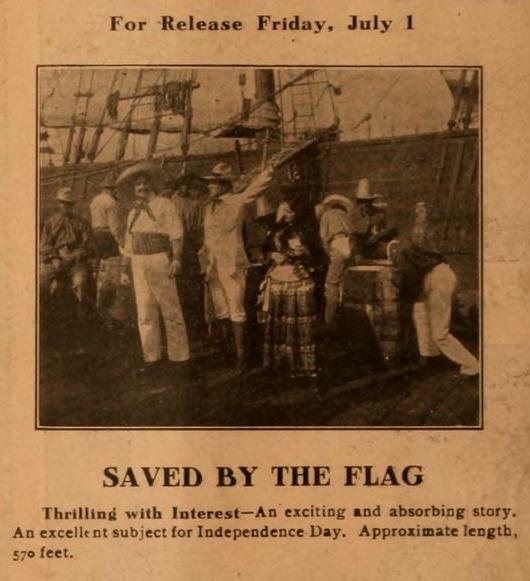 “Saved by the Flag” (Vitagraph).—A dramatic picture representing an episode in South America, where the Stars and Stripes prevent a mob, incited by an incensed discharged employee, from lynching an innocent man. There is something of a thrill in the fact that the flag is really as powerful. It is a phase which is not in evidence in this country, where its protection is a matter of course. The scenery representing South America appears to be reasonably accurate, and there is a spirit and a dash to the picture which makes it attractive and thrilling enough to make the pulses leap in sympathy with the story it tells. SAVED BY THE FLAG. In the hot sun of South America the hands employed by Hampton, an American ship owner and planter, are lazily whiling away their time when the planter unexpectedly appears upon the scene and reprimands the foreman for neglecting his duty and not urging the men to get the cargo aboard the boat that she may start her voyage on scheduled time. The foreman answers back angrily and is at once discharged by the planter. Embitted and embarrassed, the foreman decides upon revenge, which is more fully aroused when he sees his swetheart talking to the planter, who seems to be attracted by the pretty Creole. While watching the loading of the vessel a messenger arrives and hands the planter a message from an old friend, Captain Gillet, of the United States cruiser, that he has just landed his steamship in port and will take dinner with him. The captain and the planter are seated in the latter’s garden, and while smoking and talking, Paola, the pretty Creole whom we saw in the first scene, passes by the house. The captain urges his friend to go speak to her, while he waits for his return. Hampton goes to her and they walk out in the grove some distance. The discharged foreman, with murder in his heart, is watching the lovers from behind a tree, and, unobserved, shoots the girl in the back. While the planter goes for help, the foreman rushes forward and throws the pistol beside the prostrate girl, then runs for the guards, with whom he returns and accuses the planter of having shot her, pointing to the pistol as evidence. The planter is arrested and put in jail. Paola is carried to her home and placed under the care of a nurse. The foreman spreads the news of the attempted murder by the American planter, and then arouses his countrymen to hatred and vengeanc against him. He then leads the mob to the jail, where they overcome the guards and take the American out to shoot him. Paola hears from her nurse of the plight of her lover. She insists upon getting out of her bed and going to his rescue. Sick and weak, with tottering steps, she hastens to tell Captain Gillet of Hampton’s danger. The capitain sends a messenger in all speed to the American consul, who gives orders to the captain to save the planter at all cost. With the American flag the consul jumps in his automobile and starts for the place where the mob are preparing to shoot their victim. The captain of the cruiser, with a company of marines, goes to the rescue, two able-bodied seamen carrying Paola. They arrive in time to place the flag across the breast of Hampton and defy the mob to shoot at their own peril. The crowd falls back in awe, and before they can recover themselves they are driven off by the captain and his men. Hampton is released and clasps Paola in his arms amid shouts of the boys in blue and white.—570 feet. 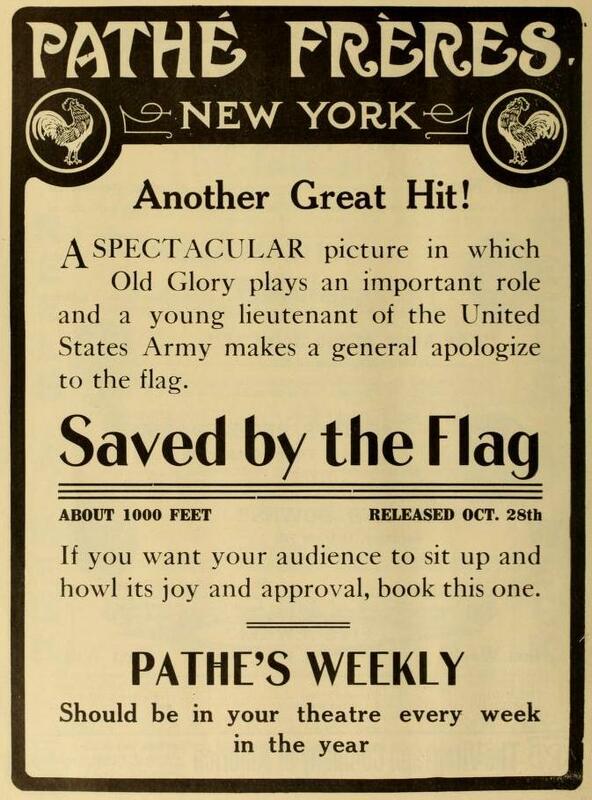 SAVED BY THE FLAG (Oct. 28).—In Mexico a lieutenant in the United States Army on leave meets a beautiful young girl, who is a particular friend of a Mexican general. By his winning ways he soon succeeds in gaming the young lady’s affection much to the chagrin of the general. Later he still further provokes the enmity of the Mexican general by compelling him to apologize for an insult to the American thug. Having fallen deeply in love with the young lady he so recently met, the lieutenant resigns from the army and takes no business in Mexico. Having done so the Mexican general is constantly on the alert for an opportunity lo revenge himself, and finally on a trumped up charge he sends a file of soldiers to arrest the American, who warned of their coming, mounts his horse with his bride and in a terrible ride makes for the frontier. The soldiers pursue him hotly, but when almost in the clutches of the Mexicans and his young wife dash across the frontier and tearing the American flag from the staff at the Custom House, wrap themselves in it and defy the representatives of Mexico. Saved by the Flag (Pathé), October 28. – A conventional love story with the scene laid in Mexico and a chase as its chief feature. A young American wins the affections of a girl from her Mexican lover, who is a general in the army. Later, on a false charge, he sends a number of soldiers to arrest the American. He and his bride mount a carriage and ride furiously for the frontier, which they reach just in time to escape the soldiers. Seizing the American flag, they wrap themselves in it in a very spectacular way and defy the Mexican authorities to take them. There is a good deal of go in this chase.